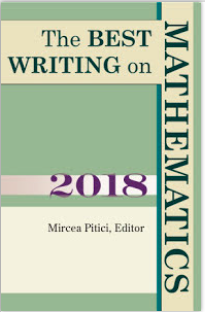 I’m honored to be included in Best Writing on Mathematics 2018, Princeton University Press. My essay “How to Play Mathematics” was originally published in Aeon. Here I argue that mathematics can be seen as a performative activity akin to music. Take jazz: while any piece of jazz could be written out as a score, the essence of jazz is an improvisational playing-out. Musicians make music in real-time, and throughout history most music hasn’t been notated. Many of the worlds beloved musicians have been sonically illiterate - not being able to read or write music - Jimi Henricks, Michael Jackson and Muddy Waters were all in this camp. Formal notations are one way to relate to music, yet most of us engage with it sensually, through our ears rather than our eyes. So too, the symbols of equations and textbooks are just one way to relate to mathematics. In my essay, I speak of math as a sensual activity that can often be engaged with through material forms of play. Islamic mosaicists made complex geometric tiling patterns that led them to discover aperiodic tilings long before Western mathematicians came to these forms. African artisans made fractal patterns in textile designs and village architecture centuries before these structures were discovered by Europeans. Moreover, when we look at the natural world, all around us we find that things are doing mathematics. Corals and nudibranchs make hyperbolic surfaces. A peregrine falcon diving towards its prey enacts a logarithmic spiral. And as sound waves bounce around a concert hall they act out the mathematics of the Fourier transform. Here I claim that such performances amount to a form of mathematical “knowing”. I’m delighted to be in this volume along with some of my favorite math writers, including Art Benjamin, Francis Su, Erik&Martin Demaine. The book is edited by Mircea Pitici. “This annual anthology brings together the year’s finest mathematics writing from around the world. Featuring promising new voices alongside some of the foremost names in the field, The Best Writing on Mathematics 2018 makes available to a wide audience many pieces not easily found anywhere else—and you don’t need to be a mathematician to enjoy them. These essays delve into the history, philosophy, teaching, and everyday aspects of math, offering surprising insights into its nature, meaning, and practice—and taking readers behind the scenes of today’s hottest mathematical debates. James Grime shows how to build subtly mischievous dice for playing slightly unfair games and Michael Barany traces how our appreciation of the societal importance of mathematics has developed since World War II. In other essays, Francis Su extolls the inherent values of learning, doing, and sharing mathematics, and Margaret Wertheim takes us on a mathematical exploration of the mind and the world—with glimpses at science, philosophy, music, art, and even crocheting. And there’s much, much more.